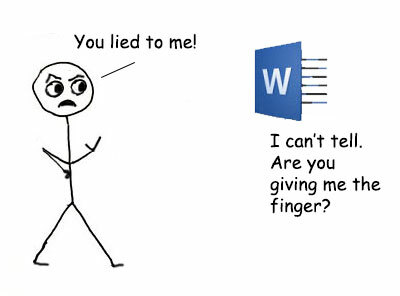 MS Word’s spell check and grammar check are useful tools, absolutely. But sometimes they get it completely wrong. I’ve already talked about the limitations of spell check, but grammar check is actually a trickier beast, sometimes offering what look like perfectly reasonable “improvements” to your work that actually are the opposite. Let’s start with spell check. I’ve talked about what it can and can’t do, but there are also times when it can try to mess with you. Homonyms: This is the obvious problem, and it’s been pretty well covered. ’Nuff said. Jargon and scientific or medical terms: Sometimes you need to know a little about the field to realize that, for example, while MS Word says you can spell it “hyperglycemia” or “hypoglycemia,” those terms are pretty much opposites. So if you’re editing something outside your scope, be prepared to Google it or ask an expert. Places and other proper nouns: This one is particularly sticky when there are alternative spellings, such as the way Americans spell “Iceland” and how the natives spell it “Ísland.” Choosing from a range of spellings sometimes is a judgment call you shouldn’t leave up to your software, which will default to your language setting. Quotes: This one comes from being a little too quick on the draw. When you’re running a spell check for a paper with quotes, be absolutely sure not to “fix” a word in a quote without checking whether the original spells it that way. OK, on to the more complicated stuff. Fragments, which sounds great except that the software tends to tag these incorrectly, particularly with sentences that are merely complex. Sentences over sixty words, as though this is some sort of crime. Split infinitives, which are no longer grammar mistakes. Sentences starting with conjunctions (also no longer a mistake). Passive voice, which is sometimes necessary. Gender-specific language, which maybe you don’t care about. The Oxford comma, which maybe you don’t use. And hey, maybe you’ve got a problem with run-on sentences or passive voice, in which case turning on those options can help you recognize when you transgress. The issue here is simply that when these warnings pop up, you might think something is “wrong” when it’s actually a mater of personal style. More worrisome are instances when grammar check gets grammar wrong. There are many signs, gestures, and symbols, and short phrases that will help when you travel. No. The “and” goes before the last item, not the third item. Formulas: Grammar check is absolutely useless when it comes to formulas, particularly in insisting that nothing can abut a parenthesis. It also freaks out when you import a symbol. There are many other ways grammar check screws up, but you get the idea. So, having established that grammar check is sometimes wrong, what can you do about it besides ignore it? The secret is to tailor the system to your needs. 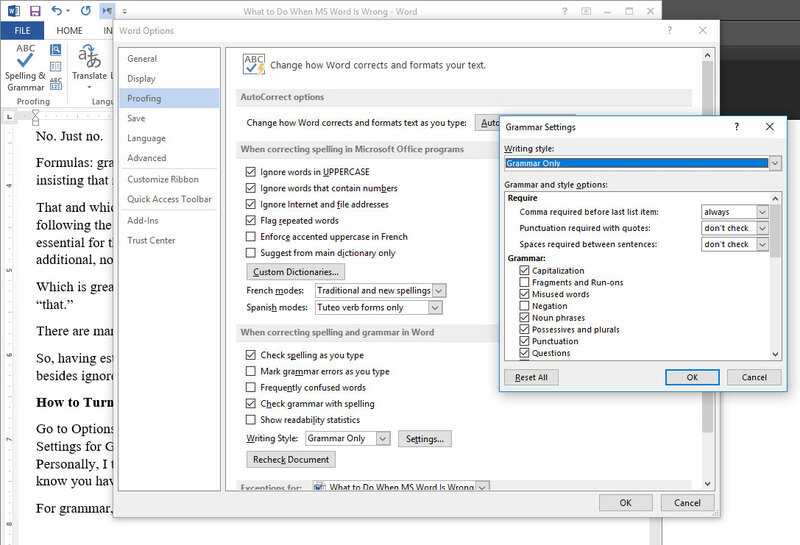 Go to Options (usually by clicking on the Word icon), then Proofing, and then click on the Settings for Grammar Check. You can check and uncheck the boxes you want or don’t want. Personally, I turn off style check altogether, but as I said, you might select an option where you know you have a problem. For grammar, I uncheck fragments and run-ons, negation, and subject/verb agreement because grammar check often gets these wrong. However, I very much appreciate punctuation, misused words, and possessives and plurals because grammar check usually gets them right and they can be tough to spot. And your settings don’t need to be etched in stone. Maybe turn some on to address a problem area, and then when you get better, change the settings for something else. You might try them all at different times to see which ones are helpful, which lead you astray, and which are just annoying. The point is, make the tool work for you. It’s your dang grammar check, after all.